A neat and flexible solution, practical folding screen using full length magnetic seals to ensure rigid when in use. 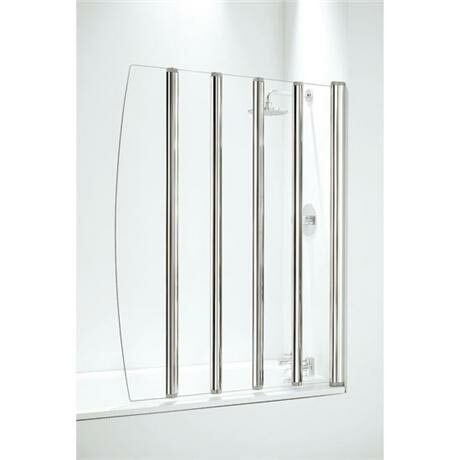 The five panel screen is designed and manufactured by leading shower specialist Coram. The bath screen folds back when out of use to create an open space and give the bathroom a spacious feel. When in use the screen covers a length of 1060mm, providing ample coverage and protection for the bathroom. Q. Can you please let me have the width of each of the four main panels please? Hi, the 4 main panels are all 215mm wide. Thank you. Q. Is this shower screen suitable for a corner bath? Unfortunately this folding bathscreen is not suitable for corner baths as it is not designed to work with more curved shapes. Hope this helps! Looks fine at first sight but I am not an expert. Have booked a provisional date for the plumber but there is a delay and I am waiting for confirmation. Love it. Will shop from you again. Very quality. couldnt believe the price of this wen i was looking arround on the net, i just ha to get it! It is all now fitted and looks amazing.